Pinot Noir. One of our favorite red wines. Not readily available from local wineries. Only a few in MD, PA and VA make it. Chaddsford in PA. Black Ankle in MD. Ankida Ridge and Loudoun Valley in VA. If there are others, I would like to know. Except, we really were bowled over by Ankida Ridge. Even in 2011, a difficult year due to the Hurricane and the Tropical Storm. This is a stellar red wine, no matter where it originates. Thank you, Early Mountain, for featuring it in your tastings, and for bringing wine from a very small vineyard to a larger audience. On TWO acres of vineyards. Sustainable practices. Eco-friendly. A winery that offers what we look for when it comes to food, and gives it to us in wine. 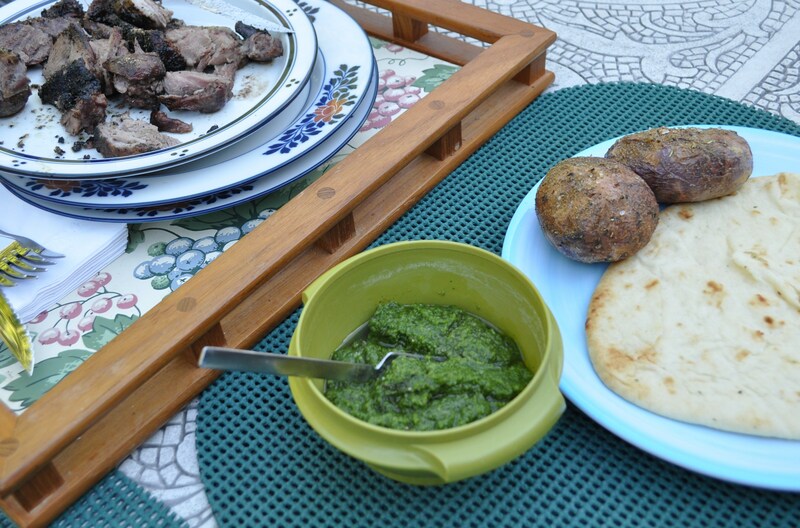 I thought it was fitting to pour the Pinot Noir with grilled lamb. Local lamb. From England Acres. We grilled a foreshank roast. Added some CSA potatoes. Pesto made with sorrel, parsley, pine nuts and Parmesan. 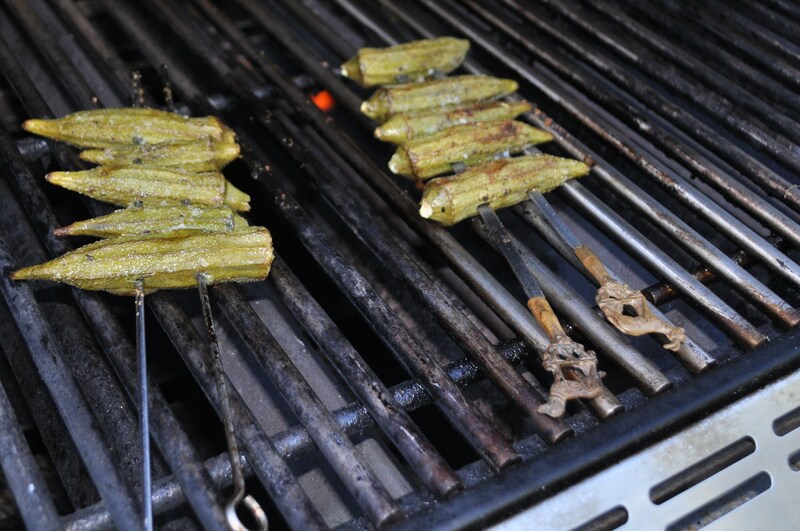 And, we grilled that pesky little okra. It all tasted wonderful. I like grilled okra. The lamb went perfectly with the Pinot Noir. Other than a few supporting ingredients, this was a completely locally sourced meal. So nice to find one of our favorite varietals just a few hours down the road. 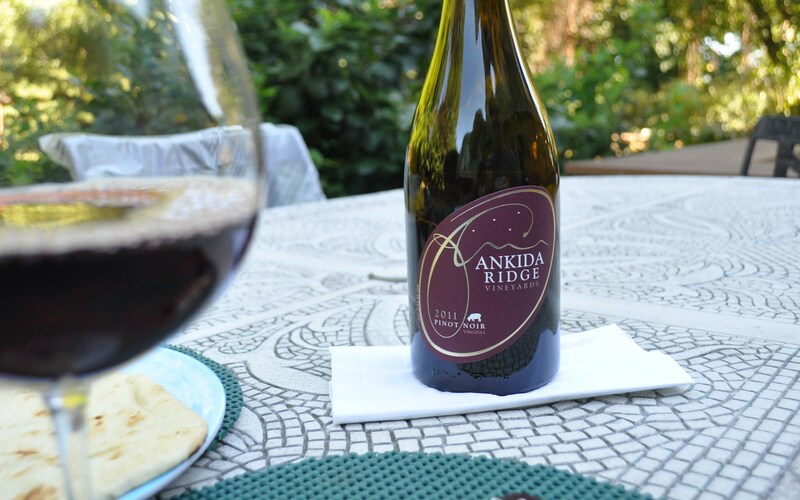 Ankida Ridge makes Pinot Noir and Chardonnay from their grapes. They also make a white and a red from grapes bought near their farm, and they call it the Voyager series. The white, made in a vinho verde style, is a combination of vidal blanc and pinot noir. Interesting combination for a white wine. Not sweet at all. Many vidals can be way too sweet, but this isn’t. All in all, these wines were a real find on our vacation weekend. 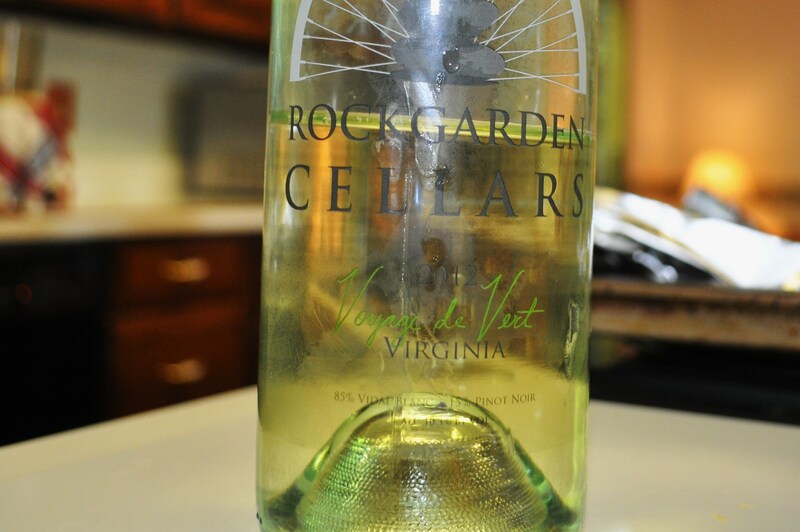 Worth seeking out if you want to support small locally owned vineyards. Posted in CSA, Farms, Food, Local Businesses, Locavore, Real Food, Wine and tagged cooking, Food, foodie, grilling, hobbies, local businesses, Locavore, VA wine, wine. Bookmark the permalink. We thank you for your kind words on Ankida Ridge. We hope to see you sometime down here on this mountainside!